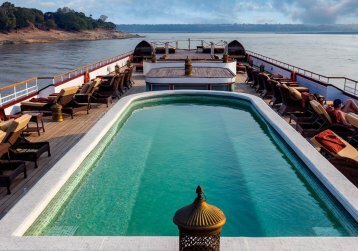 Plying the slow, swirling waters of the Mekong, The Jahan is Heritage Line’s most romantic cruise liner. 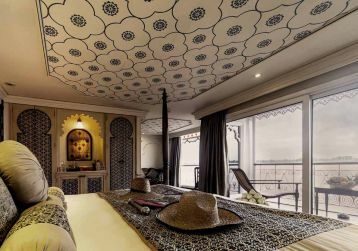 Considered the brother of The Jayavarman in Heritage Line’s “family” of cruise ships, this magnificent vessel was named after the Indian emperor Shah Jahan, who ruled the Mughal Empire from 1628 to 1658. A great patron of architecture and the arts, Shah Jahan oversaw the construction of many legendary sites, including India’s dazzling Red Fort, and the famed 777 gardens of Kashmir. This cultured monarch is a fitting namesake for The Jahan, which evokes the opulent vessels of British India. No expense has been spared in the interior or exterior decorations, which showcase the talents of local woodworkers, weavers, and artists. Every day, we offer to our guests an invigorating Tai Chi class on the sun deck. Set in your day like many local people do around Asia just as the sun begins its gentle glow. Cai Be is a rustic town criss-crossed by and many water canals. We go on-shore to visit a workshop where we learn about and observe how rice paste, rice paper, rice cookies or rice wine is manufactured. Cai Be and its surrounding areas are covered by palm trees and hence the region is also famous for the production of coconut candies. With our local boat we continue to cruise through the lush and green canel network and can observe farmers working in the fields. Back on board you may like to pamper yourself with a spa treatment or take a dip in our pool on the sun deck. Our expert guides offer a presentation on the “Life on the Mekong Delta” as the ship continues sailing to Chau Doc – near the border to Cambodia. We moor mid-stream near Chau Doc. Brace yourself for a tour around Chau Doc, a pleasant, slow-paced town with a sizeable Chinese, Kinh and Khmer community. Once on-shore we hop on “xelois” to explore Chau Doc. A “xeloi” is a local vehicle which is still used as a taxi in this region. We slowly move around the streets to see all the workshops, houses and domiciles. Get to feel the laid-back vibes of this place. We stop at the colorful local market near one of the town’s temples. This is the best time to interact with the vendors of this friendly town to practice your bargaining skills. We board our local boat and cruise past floating houses and finally reach a floating fish farm. This region is the source of a fish production that is sold all over the world. Here we get a deep insight on how fish farming works. The whole afternoon is at your own arrangements. This is the cruise part when even the last passenger will turn into cruise mode and hopefully experience the therapeutically influence this mighty river radiates. It is time for massages, time for sun bed relaxations, time for private balcony kick-backs – forsooth the time to merge with the river. A culinary class if offered during the afternoon to sharpen your knowledge and skills on the local cuisine. Some may like to do a flying visit at the bridge – the captain always has a story to share about “his” river. “The Highway Blues” beckons as we float into a state of mild bliss and before you totally drift away join our afternoon high tea for some treats. Welome to Phnom Penh – the once called Paris of the East. Despite its rapid development, it has retained a lot of its rustic charm and elegance. It is an amazing town to bespeak centuries of incredible history and culture which can still be felt at many street corners. We bid farewell to the iconic sights of Angkor and travel a short distance to the pier at the Tonle Sap Lake. By local boat we transfer to our luxurious “home” for the next days. 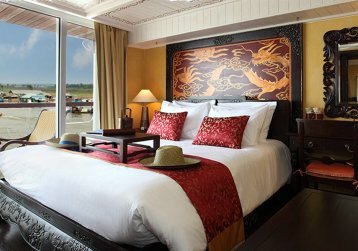 While you check in to your prepared staterooms the ship sets sail and a fascinating journey on the Mighty Mekong begins. Have lunch on board while the vessel gently glides over the Tonle Sap Lake. The lake can only be crossed during high water season (approx. from August to mid-November). Let your soul float and your eyes wander while the boat makes its way across. Our expert guide will also give a presentation about the “Geography of the Mekong and Tonle Sap Lake”. The boat moors on the Tonle River. You can join our evening cinema session (offered every night) featuring selected classic movies. Wake up early to witness the spectacular scenery at the break of dawn. Our morning Tai Chi class offers the perfect start into the day. Afterwards, the breakfast buffet is served in the dining hall. We are at Kampong Chhnang, Cambodia’s “water world”, where everything is on sticks balanced on water rich soil. It’s perhaps the most fascinating cruising spot in Cambodia. We take a local boat to the shore. By mini buses, we head to a rural village nearby for a walking tour. Our guides introduce us to the village specialities – Khmer style pottery and the making of palm sugar. You should definitely bring some home. Before returning to the boat, we explore the floating villages and wetlands of the region. Back on board, lunch is served while we continue cruising with a languid meander along the Tonle River towards Kampong Tralach. A Monks’ blessing ceremony on board delivers spirits and wishes for health and prosperity for all. Gliding through leafy swaths of this jungle-like landscape we reach Kampong Tralach. Cacophonous children wave enthusiastically while bringing their livestock for a bath in the meandering river. We will stop at the “Green School” which is partly supported by Heritage Line. See all of the river life – which is so different than ours – by a local ox cart ride. Back on board, we sail downstream passing the confluence of the Tonle and Mekong Rivers. The boat cruises overnight while you enjoy dinner in the dining hall. After a sumptuos breakfast we stay on board to learn more about the education of the young Cambodian generation (NGO project). The children will join us on board, excited to show their skills in music and art. Be sure to be bathed in smiles upon your applause. We leave the boat around 09:30 am to the enchanting pre-Angkorian temple of Wat Hanchey (7th century). This small complex sits on a hill top right on the shore with breath-taking views over the Mekong. After some refreshment back on the ship, lunch will be served. Our staff is keen on showing you the variety of traditional Khmer fashion in the afternoon. Watch the riverbanks’ life along the Mekong during our High Tea as the ship proceeds to its next stop. We arrive at the Island of Koh Oknha Tey. This spot in the middle of the Mekong owns its fame for manufacturing high class silk products. By tuk tuk we explore the island with its workshops and learn how silk is processed from its source, provided by little silkworms, to a final top quality product made of original Cambodian silk. Welcome to Phnom Penh – the once called Paris of the East. Despite its rapid development, it has retained a lot of its rustic charm and elegance. It is an amazing town with centuries of incredible history and culture which can still be felt at many street corners. We gather in the morning at our welcome lounge in Siem Reap. Relax with a drink as our staff collects your details for the boarding. We bid farewell to the iconic sight of Angkor and travel a short distance to the pier at Tonle Lake. By local boat we transfer to our beautiful ship. While you check in to your prepared staterooms the ship sets sail and your fascinating journey on the Mighty Mekong can begin. In the afternoon we serve a high tea at the bar. Enjoy your cruising day on board, relax on your balcony or relish a spa treatment before dinner. Our expert guide will also offer a presentation about the “Geography of the Mekong and Ton Le Sap”. The boat moors at the Ton Le River. You can join our evening cinema session (offered every night) featuring selected classic movies. Back on board lunch is served while the cruise continues with a languid meander along the Ton Le River towards Kampong Tralach. A Monks’ blessing ceremony on board delivers spirits and wishes for health and prosperity for all. Gliding through leafy swaths of this jungle-like landscape we arrive in Kampong Tralach. Cacophonous children wave enthusiastically while bringing their livestock for a bath in the meandering river. We will stop at the “Green School” which is supported in part by Heritage Line. Travel to see all this life – which is so much different than ours – by a local ox cart ride. Back on board we sail downstream, passing the confluence of the Ton Le and Mekong Rivers. The boat cruises overnight and you can enjoy a fine dinner in the dining hall. After some refreshment back on the ship we serve lunch. During the afternoon our staff is keen to show you the variety of traditional Khmer fashion. Watch the riverbank life along the Mekong during our high tea as the ship proceeds to its next stop. We start with a full sight-seeing tour right after breakfast. By bus we visit the Killing Fields at the outskirts of the city and after the centrally located prison “S21”. Both historic sites display the sad and cruel chapter of Khmer history when once the Khmer Rouge ruled the country with terror and suppression. Those places have not changed much since the horrific time back in the early seven- ties and so it can be heart wrenching. There is the alternative to explore the city during the morning by your own pace individually before re-joining the group. After breakfast it’s time to bid farewell from your luxurious floating home. We have lunch at a nice restaurant in town. Afterwards, our exploration of Phnom Penh focuses on its fascinating cultural heritage. The golden edifice of the Royal Palace with its Silver Pagoda and the exceptional Khmer crafts at the National Museum are the afternoon highlights. The day trip ends with a “cycle” ride back to the ship through the bustling streets of downtown Phnom Penh. Take some rest in your spacious cabin or join other fellow passengers at the bar for some refreshing drinks before captivating evening activities start. Early evening a barbecue dinner on the sun deck commences. The dinner is accompanied by an Apsara dance performance. You need to witness the brilliance and richness of this dance along with the soothing sounds of traditional music. As the evening unwinds, enjoy your supper with a fine glass of wine and marvel at the skyline of Phnom Penh and the peaceful flow of the Ton Le River. After breakfast we will gather at the lounge for a great lecture before it’s eventually time to bid a farewell to your luxurious, floating home. We gather before noontime at our welcome lounge in Saigon. Lean back with a drink as our staff welcomes you and collects your details for boarding. We bid farewell to the hustle and bustle of Saigon and travel 70 kilometers southwards by land to My Tho where we embark our luxury floating home for the upcoming journey along the Might Mekong. Upon boarding our crew warmly welcomes you and you check into your prepared staterooms. The ship set sail and your fascinating journey of exploring the Mekong can begin. Lunch buffet is served in the restaurant while the vessel steadily glides upstream to reach the overnight spot. Make yourself familiar with all the ship facilities. Now it is time to become one with one of the largest streams in Asia. The afternoon allows you pass time at your private balcony or join our tea time at the open air bar as the twilight bathes the land of the Mekong Delta into a golden haze. During the time you savour your dinner, the ship reaches Cai Be, a charming small town, famous for its Catholic French church and manufacturing of traditional crafts and food products. The floating market of Cai Be is getting smaller every year, since trading on the water is shifting more and more into the modern central markets. We drop anchor mid-stream and stay overnight near Cai Be. Every day, we offer an invigorating Tai Chi class on the sun deck to our guests. Start your day like many local people do around Asia, just as the sun begins its gentle glow. A sumptuous buffet breakfast is the perfect start for your first exploration day in the Mekong Delta. The morning tour takes you to Cai Be. Cai Be still hosts a small floating market for boat to boat trading of local goods such as fruits and agricultural products. Our guide explains the particularities of this long lasting dealing culture. Each boat has a special marker to let buyers know what goods they are selling. Cai Be is a rustic town criss-crossed by many water canals. We go on-shore to visit a workshop where we learn about the manufacturing of rice paste, rice paper, rice cookies or rice wine. Cai Be and its surrounding areas are covered by palm trees and hence the region is also famous for the production of coconut candies. With our local boat we continue to cruise through the lush and green canal network and observe farmers working in the fields. Back on board, lunch is served. Afterwards, you have free time for yourself to either enjoy a true Vietnamese coffee at the bar or simply watch the life on the riverbanks floating by. In the afternoon, we reach the area of Sa Dec. We embark a traditional sampan and take a tour towards Binh Thanh Island. This island is one of the larger ones in the vast stream of the Mekong. Some communities have settled here and make their living by growing water hyacinths. We visit exclusively one of those untouched areas. By wandering through the village we get a deep understanding of the native life. But moreover, we can follow the whole process of mat making. You can even try the weaving yourself which is still done manually. We will meet also an old local couple who shares their story on the island with us. Back on board you may like to pamper yourself with a spa treatment or take a dip into our pool on the sun deck. Our expert guides offer a presentation on the “Life in the Mekong Delta” as the ship continues sailing to Chau Doc, near the border to Cambodia. We moor mid-stream near Chau Doc. Dinner is served and afterwards you can join our evening cinema session (offered every night) featuring selected movies. Welcome to the fish sanctuary of Vietnam. Begin your day with a hearty breakfast at the dining hall or in the quiet privacy of your balcony. Brace yourself for a tour around Chau Doc, a pleasant, slow-paced town with a sizeable Chinese, Kinh and Khmer community. Once on-shore we hop on “xelois” to explore Chau Doc. A “xeloi” is a local vehicle which is still used as a taxi in this region. We slowly move around the streets to see all the workshops, houses and domiciles. Get to feel the laid-back vibes of this place. We stop at the colorful local market near one of the town’s temples. This is the best time to interact with the vendors of this friendly town to practice your bargaining skills. We board our local boat and cruise past floating houses and finally reach a floating fish farm. This region is the source of a fish production that is sold all over the world. Here we get a deep insight on how fish farming works.. The whole afternoon is at your own arrangements. This is the cruising part when even the last passenger turns on their cruise mode and hopefully experiences the therapeutic influence this mighty river radiates. It is time for massages, time for sun bed relaxations, time for private balcony kick-backs – it’s the time to merge with the river. A culinary class is offered during the afternoon to sharpen your knowledge and skills on the local cuisine. Some may like to do a flying visit at the ships bridge – where the captain is always happy about a little chit-chat. “The Highway Blues” beckons as we float into a state of mild bliss, and before you totally drift away join our afternoon high tea for some treats. Dinner is served before we arrive in the Cambodia’s capital around 8 o’clock. The boat docks at the pier of Phnom Penh. You are free to go for your first exploration by yourself. Stroll along the river promenade and watch the locals chit-chatting, selling odds and ends or have a drink in one of the numerous bars (kindly inform our crew when you are leaving the ship on your own). Welcome to Phnom Penh the once called Paris of the East. Despite its rapid development, it has retained a lot of its rustic charm and elegance. It is an amazing town of century-long, incredible history and culture which can still be felt at many street corners. After breakfast we bid farewell to our passengers of the Pearl of the Orient Cruise (3-nights). At the same time around 8 o’clock, we welcome our passengers of the Serenity Cruise (4-nights). We start with a full sight-seeing tour right after breakfast. By bus we visit the Killing Fields at the outskirts of the city and after the centrally located prison “S21”. Both historic sites display the sad and cruel chapter of Khmer history when the Khmer Rouge ruled the country with terror and suppression. Those places have merely changed much since the horrific time back in the early seventies and so it can be heart wrenching. There is the alternative to explore the city during the morning individually in your own pace before re-joining the group. We take lunch in a nice restaurant in town. Our exploration of Phnom Penh focuses afterwards on the fascinating cultural heritage of Phnom Penh. The golden edifice of the Royal Palace with its Silver Pagoda and the exceptional Khmer crafts at the National Museum are the afternoon highlights. The day trip ends with a cycle ride back to the ship through the bustling streets of downtown Phnom Penh. It begins with a variety of cocktails served on the sun deck or at the open bar. We move to the lounge which is set up for a captivating lecture about Cambodian modern history, held by a professor of the Royal University of Phnom Penh. Definitely among the highlights of this cruise to receive knowledge out of first hand as our lecturer knew the former King of Cambodia privately and many other high ranking politicians. After the lecture, a feast of a barbecue dinner commences on the sun deck. The dinner is accompanied by an Apsara dance performance. You have to witness the brilliance and richness of this dance along with the soothing sounds of traditional music. The Angkor Ban village is famous for its unspoiled community and beautiful, traditional houses. It feels like being transported back a hundred years into an era unaffected by modernity. Villagers are characterized by their unbridled friendliness. Back on board our staff is keen on showing you the variety of traditional Khmer fashion. Lunch is served after this demonstration. Before lunch our expert guides offer a presentation about the “Geography of the Mekong and Tonle Sap”. After lunch a Monks’ blessing ceremony on board will deliver spirits and wishes for health and prosperity to all. The cruiser continues its journey, passing the confluence of Mekong and Tonle River towards Kampong Tralach. Gliding through leafy swaths of this jungle-like landscape we reach Kampong Tralach. Cacophonous children waive enthusiastically while bringing their livestock for a bath in the meandering river. Live to see all this life, this is so different than ours, by a local ox cart ride. Wake up early to witness this spectacular water-world in the break of dawn. Our morning Tai Chi class has the perfect backdrop today. Breakfast buffet is served in the restaurant. Back on board lunch is served as your floating sanctuary cruises gently along the narrow and meandering Tonle, towards the Great Tonle Lake. The river opens up to a vast “sea” – known as the biggest fresh water lake in Asia. This lake can only be crossed during high water season (approx. from End-July to Mid-November). Let your soul float and your eyes wander while the boat makes its way towards Siem Reap. In the afternoon we serve a high tea at the bar and as the sun sets, our crew invites for a farewell event. Enjoy your dinner and some music and dancing afterwards together with the crew. The boat moors mid-stream near Siem Reap. Around 9 o’clock, we arrive at the Siem Reap pier and bring you back by a short transfer to the drop-off point in the city center. We hope that you enjoyed this fascinating river same as our crew does every single time. Moreover, we wish you plenty of memories and friendships that will linger with your stories of this amazing river – the Mighty Mekong. The water level goes down and very low in Tonle Sap, so the Ships have to dock in Kampong Cham, where the embarkation and disembarkation will take place. It takes 4.5 hours for our coaches to transfer to the meeting point in Siem Reap (Victoria Angkor Resort & Spa). For downstream (REP-SGN) we will meet at 08:00am for the check-in formality. For upstream (SGN-REP) the coaches will drop you off around 13:30pm at Victoria Angkor Resort & Spa. Low water season is approximate from January to middle of September. The Ship could cruise along in Tonle Sap and dock near Siem Reap pier. It just takes 45 minutes for our coaches to transfer to the meeting point (Victoria Angkor Resort & Spa). The embarkation and disembarkation of the Ship will take place near Siem Reap pier. For downstream (REP-SGN) we will meet at noon (12:00pm) at the meeting point for check in formality. For upstream (SGN-REP) the coaches will drop you off around 10:00am at Victoria Angkor Resort & Spa. High water season is approximate from middle of September to the end of December. High water and low water season just make itinerary timing schedule changeable in Siem Reap, there will be no changes at other destinations. Besides a broad choice of international and fusion dishes, discover the many varied flavors that Khmer and Vietnamese cuisine has to offer. Made from local ingredients, sometimes collected by our own guests during an excursion, our dishes please and are surprising. Our rich breakfast buffet includes live cooking stations for eggs, waffles and Vietnamese classics such as the alltime favourite “Pho” as well as a selection of pastries and fruits. Lunch is also served as a buffet while, dinner can be selected from our menu.